This excerpt below is taken from sections of The Great Means of Salvation and of Perfection, one of a number of books faithfully chronicling this great saint's many religious writings, many of which are still available today. We have highlighted certain parts of this rather lengthy piece for our readers' convenience, although all of it makes great food for thought! Although the discussion of mental prayer itself in Chapter 6 below gets quite detailed, don't feel intimidated by all this. Don't feel like you're doing something wrong if you're not following every suggestion given here! The only "wrong" way to do mental prayer is not to do it at all, or to give up on it quickly if you feel you're not "getting anything out of it." If you give up because of dryness or distractions (which all the saints experienced at one time or another) you might very well miss out on other opportunities to experience God's love and wisdom in ways you never imagined! After all, these are meant to be guidelines to help you, not hard and fast rules. This is not a recipe out of a cookbook, but rather a guide to a loving conversation with God. We suggest reading this selection slowly, thoughtfully, and prayerfully . As this article is somewhat lengthy, we've highlighted some key points in bold type to help you along. See also our article on Mental Prayer for more tips and information. In the first place, without mental prayer the soul is without light. They, says St. Augustine, who keep their eyes shut cannot see the way to their country. The eternal truths are all spiritual things that are seen, not with eyes of the body, but with the eyes of the mind; that is, by reflection and consideration. Now, they who do not make mental prayer do not see these truths, neither do they see the importance of eternal salvation, and the means which they can adopt in order to obtain it. The loss of so many souls arises from the neglect of considering the great affair of our salvation, and what we must do in order to be saved. "With desolation," says the prophet Jeremias, "is all the land made desolate: because there is none that considereth in the heart" (Jer 12:2). On the other hand, the Lord says that he who keeps before his eyes the truths of faith ------that is, death, judgment, and the happy or unhappy eternity that awaits us------shall never fall into sin. "In all thy works remember thy last end, and thou shalt never sin" (Sirach 7:36). St. Bonaventure also says that mental prayer is, as it were, a mirror, in which we see all the stains of the soul. In a letter to the Bishop of Osma, St. Teresa says, "Although it appears to us that we have no imperfections, still when God opens the eyes of the soul, as He usually does in prayer, our imperfections are then clearly seen." He who does not make mental prayer does not even know his defects, and therefore, as St. Bernard says, he does not abhor them. He does not even know the dangers to which his eternal salvation is exposed, and, therefore, he does not even think of avoiding them. But he who applies himself to meditation instantly sees his faults, and the dangers of perdition, and, seeing them, he will reflect on the remedies for them. By meditating on eternity, David was excited to the practice of virtue, and to sorrow and works of penance for his sins. "I thought upon the days of old, and I had in my mind the eternal years . . . and I was exercised, and I swept my spirit (Ps. 77:6)." When the soul, like the solitary turtle, retires and recollects itself in meditation to converse with God, then the flowers -----that is, good desires-----appear: then comes the time of pruning, that is, the correction of faults which are discovered in mental prayer. "Consider," says St. Bernard, "that the time of pruning is at hand, if the time of meditation has gone before." For [says the Saint in another place] meditation regulates the affections, directs the actions, and corrects defects. Moreover, without meditation there is not strength to resist the temptations of our enemies, and to practice the virtues of the Gospel. Meditation is like fire with regard to iron, which, when cold, is hard, and can be wrought only with difficulty. But placed in the fire it becomes soft, and the workman gives it any form he wishes, says the venerable Bartholomew a Martyribus. To observe the Divine precepts and counsels, it is necessary to have a tender heart, that is, a hart docile and prepared to receive the impressions of celestial inspirations, and ready to obey them. It was this that Solomon asked of God: "Give, therefore, to thy servant an understanding heart" (3 Kings 3: 9). Sin has made our heart hard and indocile; for, being altogether inclined to sensual pleasure, it resists, as the Apostle complained, the laws of the spirit: "But I see another law in my members, fighting against the law of my mind" (Rom. 7: 23). But man becomes docile and tender to the influence of grace which is communicated in mental prayer. By the contemplation of the Divine goodness, the great love which God has borne him, and the immense benefits which God has bestowed upon him, man is inflamed with love, his heart is softened, and made obedient to the Divine inspirations. But without mental prayer his heart will remain hard and restive and disobedient, and thus he will be lost: "A hard heart shall fare evil at the last" (Sirach 3: 27). Hence, St. Bernard exhorted Pope Eugene never to omit meditations on account of external occupations. "I fear for you, O Eugene, lest the multitude of affairs [prayer and consideration being intermitted] may bring you to a hard heart, which abhors not itself, because it perceives not." Some may imagine that the long time which devout souls give to prayer, and which they could spend in useful works, is unprofitable and lost time. But such persons know not that in mental prayer souls acquire strength to conquer enemies and to practice virtue. "From this leisure," says St. Bernard, "strength comes forth." Hence, the Lord commanded that his spouse should not be disturbed. "I adjure you . . . that you stir not up, nor awake my beloved till she please" (Song of Songs 3:5). He says, "until she please;" for the sleep or repose which the soul takes in mental prayer is perfectly voluntary, but is, at the same time, necessary for its spiritual life. He who does not sleep has not strength to work nor to walk, but goes tottering along the way. The soul that does not repose and acquire strength in meditation is not able to resist temptations, and totters on the road. In the life of the Venerable Sister Mary Crucified, we read that, while at prayer, she heard a devil boasting that he had made a nun omit the common meditation, and that afterwards, because he continued to tempt to her, she was in danger of consenting to mortal sin. The servant of God ran to the nun, and, with the Divine aid, rescued her from the criminal suggestion. Behold the danger to which one who omits meditation exposes his soul! St. Teresa used to say that he who neglects mental prayer, needs not a devil to carry him to Hell, but that he brings himself there with his own hands. And the Abbot Diocles says that "the man who omits mental prayer soon becomes either a beast or a devil." Without petitions on our part, God does not grant the Divine helps; and without aid from God, we cannot observe the Commandments. From the absolute necessity of the prayer of petition arises the moral necessity of mental prayer; for he who neglects meditation, and is distracted with worldly affairs, will not know his spiritual wants, the dangers to which his salvation is exposed, the means which he must adopt in order to conquer temptations, or ever the necessity of the prayer of petition for all men; thus, he will give up the practice of prayer, and by neglecting to ask God's graces he will certainly be lost. The great Bishop Palafox in his Annotations to the letters of St. Teresa, says: "How can charity last, unless God gives perseverance? How will the Lord give us perseverance, if we neglect to ask Him for it? And how shall we ask Him without mental prayer? Without mental prayer, there is not the communication with God which is necessary for the preservation of virtue." And Cardinal Bellarmine says, that for him who neglects meditation, it is morally impossible to live without sin. Some one may say, I do not make mental prayer, but I say many vocal prayers. But is necessary to know, as St. Augustine remarks, that to obtain the Divine grace it is not enough to pray with the tongue, it is necessary also to pray with the heart. On the words of David, "I cried to the Lord with my voice," (Ps. 141: 2) the holy Doctor says, "Many cry not with their own voice [that is, not with the interior voice of the soul], but with that of the body. Your thoughts are a cry to the Lord. Cry within, where God hears." This is what the Apostle inculcates: "Praying at all times in the spirit" (Eph. 6: 18). In general, vocal prayers are said distractedly with the voice of the body, but not of the heart, especially when they are long, and still more especially when said by a person who does not make mental prayer; and, therefore, God seldom hears them, and seldom grants the graces asked. Many say the Rosary, the Office of the Blessed Virgin, and perform other works of devotion; but they still continue in sin. But it is impossible for him who perseveres in mental prayer to continue in sin: he will either give up meditation or renounce sin. A great servant of God used to say that mental prayer and sin cannot exist together. And this we see by experience: they who make mental prayer rarely incur the enmity of Good; and should they ever have the misfortune of falling into sin, by persevering in mental prayer they see their misery and return to God. Let a soul, says St. Teresa, be ever so negligent, if it persevere in meditation, the Lord will bring it back to the haven of salvation. All the Saints have become Saints by mental prayer. Mental prayer is the blessed furnace in which souls are inflamed with the Divine love. "In my meditation," says David, "a fire shall flame out" (Ps. 39:4). St. Vincent of Paul used to say that it would be a miracle if a sinner who attends the sermons in the mission, or in the spiritual exercises, were not converted. Now, he who preaches, and speaks in the exercises, is only a man; but it is God Himself that speaks to the soul in meditation. "I will lead her into the wilderness; and I will speak to her heart" (Hosea 2:14). St. Catherine of Bologna used to say, "He who does not practice mental prayer deprives himself of the bond that unites the soul with God; hence, finding her alone, the devil will easily make her his own." "How," she would say, "can I conceive that the love of God is found in the soul that cares but little to treat with God in prayer?" Where, but in meditation, have the Saints been inflamed with Divine love? By means of mental prayer, St. Peter of Alcantara was inflamed to such a degree that in order to cool himself, he ran into a frozen pool, and the frozen water began to boil like water in a caldron placed on the fire. 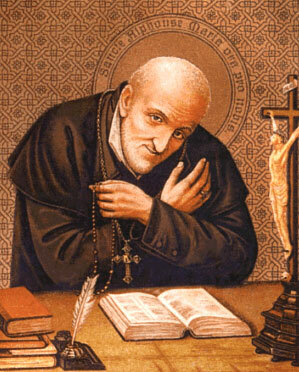 In mental prayer, St. Philip Neri became inflamed, and trembled so that he shook the entire room. In mental prayer, St. Aloysius Gonzaga was so inflamed with Divine ardor that his very face appeared to be on fire, and his heart beat as strongly as if it wished to fly from the body. St. Laurence Justinian says: "By the efficacy of mental prayer, temptation is banished, sadness is driven away, lost virtue is restored, fervor which has grown cold is excited, and the lovely flame of Divine love is augmented." Hence, St. Aloysius Gonzaga has justly said that he who does not make much mental prayer will never attain a high degree of perfection. A man of prayer, says David, is like a tree planted near the current of waters, which brings forth fruit in due time; all his actions prosper before God. "Blessed is the man . . . who shall meditate on his law day and night! And he shall be like a tree which is planted near the running waters, which shall bring forth its fruit in due season, and his leaf shall not fall off: and all whatsoever he shall do shall prosper" (Ps. 1:3). Mark the words "in due season;" that is, at the time when he ought to bear such a pain, such an affront, etc. St. John Chrysostom compared mental prayer to a fountain in the middle of a garden. Oh! what an abundance of flowers and verdant plants do we see in the garden which is always refreshed with water from the fountain! Such, precisely is the soul that practices mental prayer: you will see, that it always advances in good desires, and that it always brings forth more abundant fruits of virtue. Whence does the soul receive so many blessings? From meditation, by which it is continually irrigated. "Thy plants are a paradise of pomegranates with the fruits of the orchard . . . The fountain of gardens, the well of living waters, which run with a strong stream from Ubanus." (Song of Songs 4: 13). But let the fountain cease to water the garden, and, behold, the flowers, plants, and all instantly wither away; and why? Because the water has failed. You will see that as long as such a person makes mental prayer, he is modest, humble, devout, and mortified in all things. But let him omit meditation, and you will instantly find him wanting in modesty of the eyes, proud, resenting every word, indevout, no longer frequenting the Sacraments and the church; you will find him attached to vanity, to useless conversations, to pastimes, and to earthly pleasures; and why? The water has failed, and, therefore, fervor has ceased. "My soul is as earth without water unto thee. . . . My spirit hath fainted away" (Ps. 143:6). The soul has neglected mental prayer, the garden is therefore dried up, and the miserable soul does from bad to worse. When a soul abandons meditation, St. Chrysostom regards it not only as sick, but as dead. "He," says the holy Doctor, "who prays not to God, nor desires to enjoy assiduously His Divine conversation, is dead. . . . The death of a soul is not to be prostrated before God." The same Father says that mental prayer is the root of the fruitful vine. And St. John Climacus writes, that prayer is a bulwark against the assault of afflictions, the spring of virtues, the procurer of graces." Rufinus asserts, that all the spiritual progress of the soul flows from mental prayer. And Gerson goes so far as to say that he who neglects meditation cannot, without a miracle, lead the life of a Christian. Speaking of mental prayer, Jeremias says, "He shall sit solitary, and hold his peace; because he hath taken it up upon himself" (Lam. 3:28).That is, a soul cannot have a relish for God, unless it withdraws from creatures, and sits, that is, stops to contemplate the goodness, the love, the amiableness of God. But when solitary and recollected in meditation -----that is, when it takes away its thoughts from the world-----it is then raised above itself; and departs from prayer very different from what it was when it began it. St. Ignatius of Loyola used to say that mental prayer is the short way to attain perfection. In a word, he who advances most in meditation makes the greatest progress in perfection. In mental prayer the soul is filled with holy thoughts, with holy affections, desires, and holy resolutions, and with love for God. There man sacrifices his passions, his appetites, his earthly attachments, and all the interests of self-love. Moreover, by praying for them, in mental prayer, we can save many sinners, as was done by St. Teresa, St. Mary Magdalene de Pazzi, and is done by all souls enamored of God, who never omit, in their meditations, to recommend to Him all infidels, heretics, and all poor sinners, begging Him also to give zeal to priests who work in His vineyard, that they may convert His enemies. In mental prayer we can also by the sole desire of performing them, gain the merit of many good works which we do not perform. For, as the Lord punishes bad desires, so, on the other hand, he rewards all our good desires. In order to practice well mental prayer, or meditation, and to make it truly profitable to the soul, we must well ascertain the ends for which we attempt it. We must meditate in order to unite ourselves more completely to God. It is not so much good thoughts in the intellect as good acts of the will, or holy desires, that unite us to God; and such are the acts which we perform in meditation -----acts of humility, confidence, self-sacrifice, resignation, and especially of love and of repentance for our sins. Acts of love, says St. Teresa, are those that keep the soul inflamed with holy love. But the perfection of this love consists in making our will one with that of God; for the chief effect of love, as Dionysius the Areopagite says, is to unite the wills of those who love, so that they have but one heart and one will. St. Teresa also says, "All that he who exercises himself in prayer should aim at, is to conform himself to the Divine will, and he may be assured that in this consists the highest perfection; he who best practices this will receive the greatest gifts from God, and will make the greatest progress in an interior life." There are many, however, who complain that they go to prayer and do not find God; the reason of which is, that they carry with them a heart full of earth. "Detach the heart from creatures, says St. Teresa; seek God, and you will find Him." "The Lord is good to the soul that seeketh Him" (Lam. 3: 25). Therefore, to find God in prayer, the soul must be stripped of its love for the things of earth, and then God will speak to it: "I will lead her into the wilderness, and I will speak to her heart" (Hosea 2:14). But in order to find God, solitude of the body, as St. Gregory observes, is not enough; that of the heart is necessary too. The Lord one day said to St. Teresa: "I would willingly speak to many souls; but the world makes such a noise in their heart that my voice cannot make itself heard." Ah! When a detached soul is engaged in prayer, truly does God speak to it, and make it understand the love which He has borne it; and then the soul, says St. Laurence Justinian, burning with holy love, speaks not; but in that silence, oh, how much does it say! The silence of charity, observes the same writer, says more to God than could be said by the utmost powers of human eloquence; each sigh that it utters is a manifestation of its whole interior. It then seems as if it could not repeat often enough, "My Beloved to me, and I to Him." We must meditate in order to obtain from God the graces that are necessary to advance in the way of salvation, and especially to avoid sin, and to use the means which will lead us to perfection. The best fruit which comes from meditation is the exercise of prayer. Almighty God, ordinarily speaking, does not give grace to any but those who pray. St. Gregory writes: "God desires to be entreated; He desires to be constrained; He desires to be, as it were, conquered by importunity." It is true that at all times the Lord is ready to hear us, but at the time of meditation, when we are most truly in converse with God, He is most bountiful in giving us His aid. Above all, should we, in meditation, ask God for perseverance and His holy love. Final perseverance is not a single grace, but a chain of graces, to which must correspond the chain of our prayers. If we cease to pray, God will cease to give us His help, and we shall perish. He who does not practice meditation will find the greatest difficulty in persevering in grace till death. Let us remember what Palafox says: "How will the Lord give us perseverance if we do not ask it? And how shall we ask for it without meditation? Without meditation there is no communion with God." We must also be urgent with prayers to obtain from God His holy love. St. Francis de Sales says that all virtues come in union with holy love. "All good things came to me together with her." Let us, therefore, pray continually for perseverance and love; and, in order to pray with greater confidence, let us ever bear in mind the promise made us by Jesus Christ, that whatever we seek from God through the merits of His Son, He will give it us. Let us, then, pray, and pray always, if we would that God should make us abound in every blessing. Let us pray for ourselves, and, if we have zeal for the glory of God, let us pray also for others. It is a thing most pleasing to God to be entreated for unbelievers and heretics, and all sinners. "Let the people confess to Thee, a God; let all the people confess to Thee." [Ps. 66: 6] Let us say, O Lord, make them know Thee, make them love Thee. We read in the lives of St. Teresa and St. Mary Magdalene of Pazzi how God inspired these holy women to pray for sinners. And to prayer for sinners let us also add prayers for the Holy Souls in Purgatory. We must apply ourselves to meditation, not for the sake of spiritual consolations, but chiefly in order to learn what is the will of God concerning us. "Speak Lord," said Samuel to God, "for Thy servant heareth" (1 Kings 3: 9). Lord, make me to know what Thou wilt, that I may do it. Some persons continue meditation as long as consolations continue; but when these cease, they leave off meditation. It is true that God is accustomed to comfort His beloved souls at the time of meditation, and to give them some foretaste of the delights He prepares in Heaven for those who love Him. These are things which the lovers of the world do not comprehend; they who have not taste except for earthly delights despise those which are celestial. Oh, if they were wise, how surely would they leave their pleasures to shut themselves in their closets, to speak alone with God! Meditation is nothing more than a converse between the soul and God; the soul pours forth to Him its affections, its desires, its fears, its requests, and God speaks to the heart, causing it to know His goodness, and the love which He bears it, and what it must do to please Him. But these delights are not constant, and for the most part, holy souls experience much dryness of spirit in meditation. "With dryness and temptations," says St. Teresa, "the Lord makes proof of those who love Him." And she adds, "Even if this dryness lasts through life, let not the soul leave off meditation; the time will come when all will be well rewarded." The time of dryness is the time for gaining the greatest rewards; and when we find ourselves apparently without fervor, without good desires, and, as it were, unable to do a good act, let us humble ourselves and resign ourselves, for this very meditation will be more fruitful than others. It is enough then to say, if we can say nothing more, "O Lord, help me, have mercy on me, abandon me not!" Let us also have recourse to our comforter, the most holy Mary. Happy he who does not leave off meditation in the hour of desolation. The Holy Spirit says, "In all thy works remember thy last end, and thou shalt never sin" (Sirach 7:36). He who often meditates on the four last things-----namely, death, judgment, and the eternity of Hell and Paradise will not fall into sin. But these truths are not seen with the eye of the body; the soul only perceives them. If they are not mediated on, they vanish from the mind; and then the pleasures of the senses present themselves, and those who do not keep before themselves the eternal truths are easily taken up by them; and this is the reason why so many abandon themselves to vice, and are damned. All Christians know and believe that they must die, and that we shall all be judged; but because they do not think about this, they will live far away from God. If we, moreover, do not meditate especially on our obligation to love God on account of His infinite perfections and the great blessings that He has conferred upon us, and the love that He has borne us, we shall hardly detach ourselves from the love of creatures in order to fix our whole love on God. It is in the time of prayer that God gives us to understand the worthlessness of earthly things, and the value of the good things of Heaven; and then it is that He inflames with His love those hearts that do not offer resistance to His calls. After all, the good rule is that we preferably meditate on the truths and mysteries that touch us more and procure for our soul the most abundant nourishment. Yet the subject most suitable for a person that aspires to perfection ought to be the Passion of our Lord. Louis Blosius relates that our Lord revealed to several holy women -----to St. Gertrude, St. Bridget, St. Mechtilde, and St. Catherine of Siena-----that they who meditate on His Passion are very dear to Him. According to St. Francis de Sales, the Passion of our Redeemer should be the ordinary subject of the meditation of every Christian. Oh, what an excellent book is the Passion of Jesus! There we understand, better than in any other book, the malice of sin, and also the mercy and love of God for man. 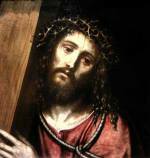 To me it appears that Jesus Christ has suffered so many different pains-----the Scourging, the Crowning with thorns, the Crucifixion, etc.-----that, having before our eyes so many painful mysteries, we might have a variety of different subjects for meditating on His Passion, by which we might excite sentiments of gratitude and love. We can meditate in every place, at home or elsewhere, even in walking, in working. How many are there who, not being able to do so otherwise, raise their hearts to God and apply their minds to mental prayer without leaving for this purpose their occupations, their work, or meditate even when traveling! He who seeks God will find Him everywhere at all times. The essential condition to converse with God is the solitude of the heart, without which prayer would be worthless, and, as St. Gregory says, it would profit us little or nothing to be with the body in a solitary place, while the heart is full of worldly thoughts and affections. But to enjoy the solitude of the heart, which consists in being disengaged from worldly thoughts and affections, deserts and caves are not absolutely necessary. Those who from necessity are obliged to converse with the world, whenever their hearts are free from worldly attachments, even in the public streets, in places of resort, and public assemblies, can possess a solitude of heart, and continue united with God. All those occupations that we undertake in order to fulfill the Divine will have no power to prevent the solitude of the heart. St. Catharine of Siena truly found God in the midst of the household labors in which her parents kept her employed in order to draw her from devotional exercises; but in the midst of these affairs she preserved a retirement in her heart, which she called her cell, and there ceased not to converse with God alone. However, when we can, we should retire to a solitary place to make our meditation. Our Lord has said, "When thou shalt pray, enter thy chamber, and, having shut the door, pray to thy Father in secret" (Matt. 6: 6). St. Bernard says that silence, and the absence of all noise, almost force the soul to think of the goods of Heaven. But the best place for making mental prayer is the church; for Jesus Christ especially delights in the meditation that is made before the Blessed Sacrament, since there it appears that He bestows light and grace most abundantly upon those who visit Him. He has left Himself in this Sacrament, not only to be the food of souls that receive Him in Holy Communion, but also to be found at all times by every one who seeks Him. Devout pilgrims go to the holy House of Loreto, where Jesus Christ dwelt during His life; and to Jerusalem, where He died on the Cross; but how much greater ought to be our devotion when we find Him before us in the tabernacle, in which this Lord Himself now dwells in person, Who lived among us, and died for us on Calvary! It is not permitted in the world for persons of all ranks to speak alone with kings; but with Jesus Christ, the King of kings, both nobles and plebeians, rich and poor, can converse at their will, setting before Him their wants, and seeking His grace; and there Jesus gives audience to all, hears all, and comforts all. We have here to consider two things -----namely, the time of the day most suitable for mental prayer, and the time to be spent in making it. 1. According to St. Bonaventure, the morning and the evening are the two parts of the day which, ordinarily speaking, are the fittest for meditation. But, according to St. Gregory of Nyssa, the morning is the most seasonable time for prayer, because says the Saint, when prayer precedes business, sin will not find entrance into the soul. And the Venerable Father Charles Carafa, founder of the Congregation of the Pious Workers, used to say that a fervent act of love, made in the morning during meditation, is sufficient to maintain the soul in fervor during the entire day. Prayer, as St. Jerome has written, is also necessary in the evening. Let not the body go to rest before the soul is refreshed by mental prayer, which is the food of the soul. But at all times and in all places we can pray; it is enough for us to raise the mind to God, and to make good acts, for in this consists mental prayer. 2. With regard to the time to be spent in mental prayer, the rule of the Saints was, to devote to it all the hours that were not necessary for the occupations of human life. St. Francis Borgia employed in meditation eight hours in the day, because his Superiors would not allow him a longer time; and when the eight hours had expired, he earnestly asked permission to remain a little longer at prayer, saying, "Ah! Give me another little quarter of an hour." St. Philip Neri was accustomed to spend the entire night in prayer. St. Anthony the Abbot remained the whole night in prayer; and when the sun appeared, which was the time assigned for terminating his prayer, he complained of it for having risen too soon. Father Balthassar Alvarez used to say that a soul that loves God, when not in prayer, is like a stone out of its center, in a violent state 'for in this life we should, as much as possible' imitate the life of the Saints in bliss, who are constantly employed in the contemplation of God. But let us come to the particular time which a religious who seeks perfection should devote to mental prayer. Father Torres prescribed an hour's meditation in the morning, another during the day, and a half-hour's meditation in the evening, when they should not be hindered by sickness, or by any duty of obedience. If to you this appears too much, I counsel you to give at least two hours to mental prayer. It is certain that a half-hour's meditation each day would not be sufficient to attain a high degree of perfection; for beginners, however, this would be sufficient. Sometimes the Lord wishes you to omit prayer in order to perform some work of fraternal charity; but it is necessary to attend to what St. Laurence Justinian says: "When charity requires it, the spouse of Jesus goes to serve her neighbor; but during that time she continually sighs to return to converse with her Spouse in the solitude of her cell." Father Vincent Carafa, General of the Society of Jesus, stole as many little moments of time as he could, and employed them in prayer. Mental prayer is tedious to those who are attached to the world, but not to those who love God only. Ah! Conversation with God is not painful nor tedious to those who truly love Him. His conversation has no bitterness, His company produces not tediousness, but joy and gladness." Mental prayer, says St. John Climacus is nothing else than a familiar conversation and union with God. In prayer, as St. Chrysostom says, the soul converses with God, and God with the soul. No, the life of holy persons who love prayer, and fly from earthly amusements, is not a life of bitterness. If you do not believe me, "Taste and see that the Lord is sweet" (Ps. 33: 9). Try it, and you shall see how sweet the Lord is to those who leave all things in order to converse with Him only. But the end which we ought to propose to ourselves in going to meditation should be, as has been said several times, not spiritual consolation, but to learn from our Lord what He wishes from us, and to divest ourselves of all self-love. "To prepare yourself for prayer," says St. John Climacus, "put off your own will." To prepare ourselves well for meditation, we must renounce self-will, and say to God, "Speak, Lord, for Thy servant heareth." Lord, tell me what Thou wishest me to do; I am willing to do it. And it is necessary to say this with a resolute will, for without this disposition the Lord will not speak to us. Begin by disposing your mind and body to enter into pious recollection. Leave at the door of the place where you are going to converse with God all extraneous thoughts, saying, with St. Bernard, O my thoughts! wait here: after prayer we shall speak on other matters. Be careful not to allow the mind to wander where it wishes; but should a distracting thought enter, act as we shall tell you in Chapter 7. The posture of the body most suitable for prayer is to be kneeling; but if this posture becomes so irksome as to cause distractions, we may, as St. John of the Cross says, make our meditation while modestly sitting down. "My God, I believe that Thou art here present, and I adore Thee with my whole soul". Be careful to make this act with a lively faith, for a lively remembrance of the Divine presence contributes greatly to remove distractions. Cardinal Carracciolo, Bishop of Aversa, used to say that when a person is distracted in prayer there is reason to think that he has not made a lively act of faith. 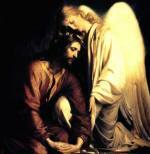 "Lord, I should now be in Hell in punishment of the offenses I have given Thee. I am sorry for them from the bottom of my heart; have mercy on me." "Eternal Father, for the sake of Jesus and Mary, give me light in this meditation, that I may draw fruit from it." We must then recommend ourselves to the Blessed Virgin by saying a "Hail Mary," to St. Joseph, to our Guardian Angel, and to our holy Patron. These acts, says St. Francis de Sales, ought to be made with fervor, but should be short that we may pass immediately to the meditation. When you make meditation privately you may always use some book, at least at the commencement, and stop when you find yourself most touched. St. Francis de Sales says that in this we would do as the bees that stop on a flower as long as they find any honey on it, and then pass on to another. St. Teresa used a book for seventeen years; she would first read a little, then meditate for a short time on what she had read. It is useful to meditate in this manner, in imitation of the pigeon that first drinks and then raises its eyes to Heaven. When mental prayer is made in common, one person reads for the rest the subject of meditation and divides it into two parts: the first is read at the beginning, after the preparatory acts; the second, towards the middle of the half hour, or after the Consecration if the meditation is made during the Mass. One should read in a loud tone of voice, and slowly, so as to be well understood. It should be remembered that the advantage of mental prayer consists not so much in meditating as in making affections, petitions, and resolutions: these are the three principal fruits of meditation. "The progress of a soul," says St. Teresa, "does not consist in thinking much of God, but in loving Him ardently; and this love is acquired by resolving to do a great deal for Him." Speaking of mental prayer, the spiritual masters say that meditation is, as it were, the needle which, when it has passed, must be succeeded by the golden thread, composed, as has been said, of affections, petitions, and resolutions; and this we are going to explain. When you have reflected on the point of meditation, and feel any pious sentiment, raise your heart to God and offer Him acts of humility, of confidence, or of thanksgiving; but, above all, repeat in mental prayer acts of contrition and of love. The act of love, as also the act of contrition, is the golden chain that binds the soul to God. "My God, I esteem Thee more than all things." "I love Thee with my whole heart. I delight in Thy felicity." "I would wish to see Thee loved by all. I wish only what Thou wishest." "Make known to me what Thou wishest from me and I will do it." "Dispose as Thou pleasest of me and of all that I possess." This last act of oblation is particularly dear to God. In meditation, among the acts of love towards God, there is none more perfect than the taking delight in the infinite joy of God. This is certainly the continual exercise of the blessed in Heaven; so that he who often rejoices in the joy of God begins in this life to do that which he hopes to do in Heaven through all eternity. It may be useful here to remark, with St. Augustine, that it is not the torture, but the cause, which makes the martyr. Whence St. Thomas [2. 2, q. 124, a. 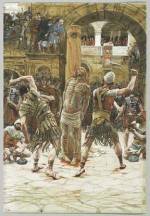 5] teaches that martyrdom is to suffer death in the exercise of an act of virtue. From which we may infer, that not only he who by the hands of the executioner lays down his life for the faith, but whoever dies to comply with the Divine will, and to please God, is a martyr, since in sacrificing himself to the Divine love he performs an act of the most exalted virtue. We all have to pay the great debt of nature; let us therefore endeavor, in holy prayer, to obtain resignation to the Divine will -----to receive death and every tribulation in conformity with the dispensations of His Providence. As often as we shall perform this act of resignation with sufficient fervor, we may hope to be made partakers of the merits of the Martyrs. St. Mary Magdalene, in reciting the doxology, always bowed her head in the same spirit as she would have done in receiving the stroke of the executioner. Remember that we here speak of the ordinary mental prayer; for should anyone feel himself at any time united with God by supernatural or infused recollection, without any particular thought of an eternal truth or of any Divine mystery, he should not then labor to perform any other acts than those to which he feels himself sweetly drawn to God. It is then enough to endeavor, with loving attention, to remain united with God, without impeding the Divine operation, or forcing himself to make reflections and acts. But this is to be understood when the Lord calls the soul to this supernatural prayer; but until we receive such a call, we should not depart from the ordinary method of mental prayer, but should, as has been said, make use of meditation and affections. However, for persons accustomed to mental prayer, it is better to employ themselves in affections than in consideration. Moreover, in mental prayer it is very profitable, and perhaps more useful than any other act, to repeat petitions to God, asking, with humility and confidence, His graces; that is, His light, resignation, perseverance, and the like; but, above all, the gift of His holy love. St. Francis de Sales used to say that by obtaining the Divine love we obtain all graces; for a soul that truly loves God with its whole heart will, of itself, without being admonished by others, abstain from giving Him the smallest displeasure, and will labor to please Him to the best of its ability. "My Jesus, mercy. Lord, for the sake of Thy mercy, assist me." And the meditation made in this manner will be for you perhaps the most useful and fruitful. The Venerable Paul Segneri used to say that until he studied theology, he employed himself during the time of mental prayer in making reflections and affections; but "God" [these are his own words] "afterwards opened my eyes, and thenceforward I endeavored to employ myself in petitions; and if there is any good in me, I ascribe it to this exercise of recommending myself to God." Do you likewise do the same; ask of God His graces, in the name of Jesus Christ, and you will obtain whatsoever you desire. This is our Saviour has promised, and His promise cannot fail: "Amen, amen, I say to you, if you ask the Father anything in My name, He will give it you." In a word, all mental prayer should consist in acts and petitions. Hence, the Venerable Sister Mary Crucified, while in an ecstasy, declared that mental prayer is the respiration of the soul; for, as by respiration, the air is first attracted, and afterwards given back, so, by petitions, the soul first receives grace from God, and then, by good acts of oblation and love, it gives itself to Him. In terminating the meditation it is necessary to make a particular resolution; as, for example, to avoid some particular defect into which you have more frequently fallen, or to practice some virtue, such as to suffer the annoyance which you receive from another person, to obey more exactly a certain Superior, to perform some particular act of mortification. We must repeat the same resolution several times, until we find that we have got rid of the defect or acquired the virtue. Afterwards reduce to practice the resolutions you have made, as soon as an occasion is presented. You would also do well, before the conclusion of your prayer, to renew the vows or any particular engagement by vow or otherwise that you have made with God. This renewal is most pleasing to God if we multiply the merit of the good work, and draw down upon us a new help in order to persevere and to grow in grace. 1. In thanking God for the lights received. 2. In making a purpose to fulfill the resolutions made. 3. In asking of the Eternal Father, for the sake of Jesus and Mary, grace to be faithful to Them. Be careful never to omit, at the end of meditation, to recommend to God the Souls in Purgatory and poor sinners. St. John Chrysostom says that nothing more clearly shows our love for Jesus Christ than our zeal in recommending our brethren to Him. St. Francis de Sales remarks that in leaving mental prayer we should take with us a nosegay of flowers, in order to smell them during the day; that is, we should remember one or two points in which we have felt particular devotion, in order to excite our fervor during the day. The ejaculations which are dearest to God are those of love, of resignation, of oblation of ourselves. Let us endeavor not to perform any action without first offering it to God, and not to allow at the most a quarter of an hour to pass, in whatever occupations we may find ourselves, without raising the heart to the Lord by some good act. Moreover, in our leisure time, such as when we are waiting for a person, or when we walk in the garden, or are confined to bed by sickness, let us endeavor, to the best of our ability, to unite ourselves to God. It is also necessary by observing silence, by seeking solitude as much as possible, and by remembering the presence of God, to preserve the pious sentiments conceived in meditation. If, after having well prepared ourselves for mental prayer, as had been explained in a preceding paragraph, a distracting thought should enter, we must not be disturbed, nor seek to banish it with a violent effort; but let us remove it calmly and return to God. Let us remember that the devil labors hard to disturb us in the time of meditation, in order to make us abandon it. Let him, then, who omits mental prayer on account of distractions, be persuaded that he gives delight to the devil. It is impossible, says Cassian, that our minds should be free from all distractions during prayer. Finally, when we perceive that we are deliberately distracted, let us desist from the voluntary defect and banish the distraction, but let us be careful not to discontinue our meditation. The greatest pain of souls in meditation is to find themselves sometimes without a feeling of devotion, weary of it, and without any sensible desire of loving God; and with this is joined the fear of being in the wrath of God through their sins, on account of which the Lord has abandoned them; and being in this gloomy darkness, they know not how to escape from it, it seeming to them that every way is closed against them. When a soul gives itself up to the spiritual life, the Lord is accustomed to heap consolations upon it, in order to wean it from the pleasures of the world, but afterwards, when He sees it more settled in spiritual ways, He draws back His hand, in order to make proof of its love, and to see whether it serves and loves God unrecompensed, while in this world, with spiritual joys. Some foolish persons, seeing themselves in a state of aridity, think that God may have abandoned them; or, again, that the spiritual life was not made for them; and so they leave off prayer, and lose all that they have gained. In order to be a soul of prayer, man must resist with fortitude all temptations to discontinue mental prayer in the time of aridity. St. Teresa has left us very excellent instructions on this point. In one place she says, "The devil knows that he has lost the soul that perseveringly practices mental prayer." In another place she says, "I hold for certain that the Lord will conduct to the haven of salvation the soul that perseveres in mental prayer, in spite of all the sins that the devil may oppose." Again, she says, "He who does not stop in the way of mental prayer reaches the end of his journey, though he should delay a little." Finally she concludes, saying, "By aridity and temptations the Lord proves His lovers, Though aridity should last for life, let not the soul give up prayer: the time will come when all shall be well rewarded." The Angelic Doctor says that the devotion consists not in feeling, but in the desire and resolution to embrace promptly all that God wills. Such was the prayer that Jesus Christ made in the Garden of Olives; it was full of aridity and tediousness, but it was the most devout and meritorious prayer that had ever been offered in this world. It consisted in these words: My Father, not what I will, but what Thou wilt. Hence, never give up mental prayer in the time of aridity. Should the tediousness which assails you be very great, divide your meditation into several parts, and employ yourself, for the most part, in petitions to God, even though you should seem to pray without confidence and without fruit. It will be sufficient to say and to repeat: "My Jesus, mercy. Lord, have mercy on us." Pray, and doubt not that God will hear you and grant your petition. In going to meditation, never propose to yourself your own pleasure and satisfaction, but only to please God, and to learn what He wishes you to do. And, for this purpose, pray always that God may make known to you His will, and that He may give you strength to fulfill it. All that we ought to seek in mental prayer is, light to know, and strength to accomplish, the will of God in our regard.